I found this FREE on Facebook. Does it have potential for a good enclosure provided I screen the top, front, and sides? Any ideas. I was thinking of using “great stuff” for the back and either go bioactive or cutting a hole to fit a 5gal bucket for lay bin. Any ideas or suggestions are welcome. Also, if anybody sees problems, please let me know! I would hate to go pick up this heavy thing for nothing! Edit to add my husband is in construction & renovation so I have access to all of the tools I would need, but would probably end up doing the work myself...I have plenty of practice using power tools but can’t promise how it will look! Looks pretty cool. What are the dimensions of the inside top part? 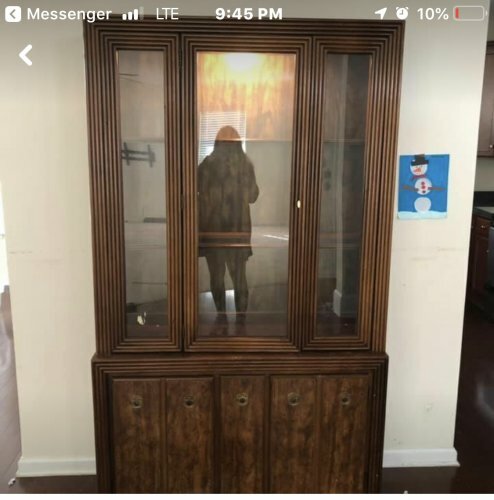 The lady is supposed to be measuring now and sending them, but it looks like it would be large enough if I take out the inside tv stand/box thing. Looks can be deceiving though! That’s a lot of work but it does have potential. Your biggest challenge is probably going to be screening the front display. The doors retract on tracking? If the do than it may not be so hard to frame the screen or whatever material you use and put track rollers to do the same thing. You could perfect it’s suzing that way there’s no gap between doors. Good luck! Yeah that was what I was thinking too. I have bought a few things because they looked to be the right size and then were small as hell lol. I think it has a lot of potential. 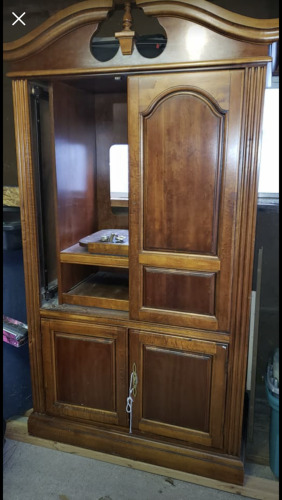 It looks pretty deep like an old hidden tv stand and if you removed all the built in pieces on the top it could be tall enough too. From the pics looks like your width is about 3 feet. That would make a fine bioactive viv. Most important thing to keep in mind is to take your time and plan your work. 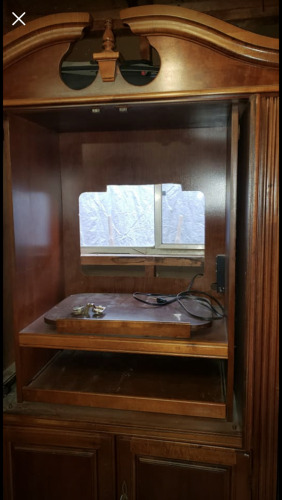 If this were my viv I’d keep the doors like they are function wise but I would cut out the middle sections and replace them with hi-visibility screens. Yep, I was concerned about the doors too. I would love to have the front glass with magnetic closure but doubt I could find the right size. I will definitely enlist the help of the hubby for that part...however we end up doing it. I like that idea! Doors need new hinges and hardware but I think cutting where you outlined is definitely a good idea! What’s wrong with hardware? Just cosmetic? Mostly cosmetic, but one door isn’t even attached...missing hinge. I figure if I have to replace that I might as well pick out what I want for the rest of it. Cool, do you plan to keep the sliding pocket doors? I’ve never seen a conversion with them before, would be very unique! Actually, we decided that even though it was free it was a little too much of a project. Plus when we got the measurements I have no idea where we would put something that size! I have been looking at this for $50. I’m going to take a look at it on Sunday. It has a slightly smaller depth than it should be, but I’m brainstorming ways to build on couple of inches to the back of the enclosure...or is it permissible to be a little shallow provided the height and length are larger? Useable space is 44”x15”x51” for veiled female. I know that’s 3 in too shallow for minimum requirements. That’s why I was thinking of expanding on the back end. 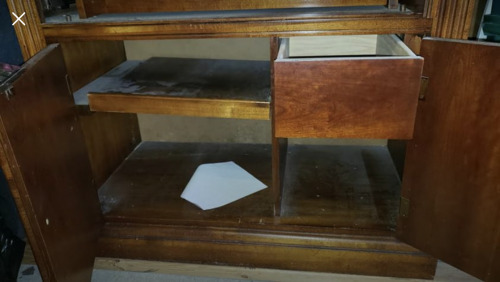 It looks like it is in great condition! Yes, she said she meant to take it off the website because a glass shelf broke while moving it. Since I don't need the shelves it worked out great and she is giving me a discount since a shelf is broken I am very pleased with this find and glad to hear the dimensions are acceptable! That means less work! Very cool. I am looking forward to seeing what you do with it! Just some thoughts. If there is a lot of pressed wood or plywood in it you will need to do more waterproofing because they will not hold up to the constant humidity as well as solid wood will. I have removed the wooden pieces that held the glass shelves and measured and marked where I plan to cut. I haven’t cut into the main cabinet yet, but as far as I can tell, it is mostly solid wood except the back panel behind the bottom cabinet and possibly the door. Fingers crossed. I plan to sand & waterproof the entire inside and bottom after I cut the top, sides, and drainage hole. I am going to put aluminum screen on the top and both sides. I really like the glass in the front, but I’m wondering if it would be best to screen it as well. I’m toying with the idea of leaving it and seeing how it works for a couple of days before putting the Cham in, and then screening if necessary. I am only getting a little bit of work done each day after work, but I will post pics when I get a little further along.